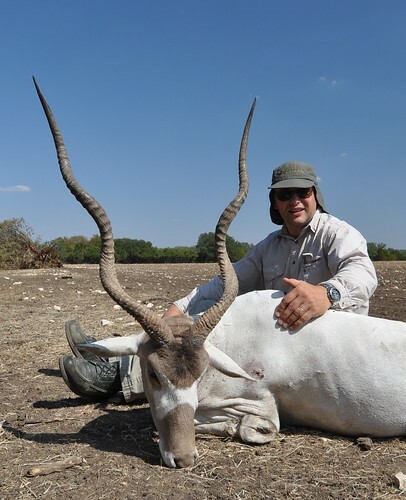 The antelope hunt that takes the prize when it comes to super exotics is Addax hunting. The Addax is extremely rare in the wild with estimates of their numbers at 200 to 500. Fortunately, they are not as rare in captivity and when given a chance to thrive, they do so amazingly well, especially in the Texas Hill Country. That’s why we here at the V-Bharre Hunting Ranch are proud to offer our special Addax hunting packages. Addax, closely related to the Oryx, is an antelope considered critically endangered in the wild. Native to the African Sahara Desert, they have been over-hunted for their horns while their habitat has been lost to housing, farming and industry. Several countries have programs helping to re-establish their herds back into the Sahara. The coat of the Addax is off-white in winter and white to sandy in summer. The face sports red nostrils and a white “X” above the nose with a throat beard made up of long hairs. The underbelly, limbs, rump and lips are white and the Addax sports a small dense neck mane. They grow 3.6 to 4.3 feet in length, 3.1 to 4 feet at the shoulder and have a tail length of 10 to 14 inches. With a lifespan of up to 19 years, Addaxes weigh 132 to 275 pounds. Denizens of the desert, they have the physical characteristics needed to survive in that hot, harsh climate. With long dewclaws and flat broad feet to keep them from sinking in the sand, Addaxes do not need to drink water. Capable of sustaining an internal temperature of 155 degrees, they get all the water they need from dew and the food they eat. Known also as “screw horn antelope” because of their long, thin spiraled horns, both sexes grow horns with those of the male being more favored. With normally two twists per horn, they can grow to a trophy length of 40 inches or longer. On average, the horns of females grow from 1.8 feet to 2.6 feet and the males from 2 to 3.6 feet. These exotics are considered one of the most unusual and prized trophies one can harvest. 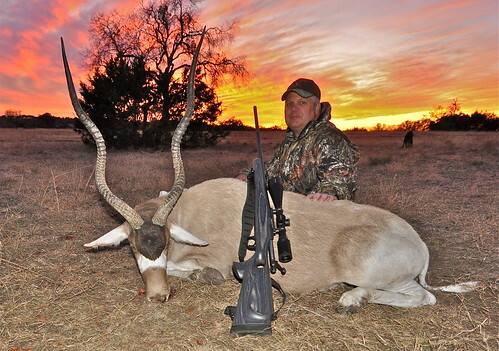 With our one-on-one guides, you’ll be treated to an Addax hunting experience you’ll never forget. So hurry up and book today for one of our Addax hunting packages before we’re all full up. This is one exotic trophy hunt you won’t want to miss.